In this blog post, I want to explain what camera equipment you need as a beginner in concert photography. You´ve probably seen music photographers with 2 camera bodies and huge lenses hanging around their necks. Although this might be normal working equipment for professional concert photographers, it´s absolutely not necessary to have this expensive gear when you´re just starting out. Read on and get my suggestions about what crucial gear you need to begin your new career in concert photography. If you are just starting out read my article about Basics in Concert Photography I: Aperture, Shutter Speed and ISO first. Here we go, this is the camera system you will want to invest in. I’d like to introduce you to the Digital Single Lens Reflex camera system, or, for short, DSLR. In a DSLR camera, light travels through the lens, then to a mirror that switches between sending the image to either the viewfinder or the image sensor. This is the camera type that you’ll find most professionals using and it’s the only camera system that makes sense to use in concert photography at the moment (which might change in the near future). The advantage of this system is the fact that you can buy multiple lenses with different focal lengths and apertures. You can get ultra wide angle lenses, which are great for when you’re right in front of a small stage, and you can get 500mm lenses for when you’re shooting The Rolling Stones from 30m away at a stadium. The downside is the price tag attached to these cameras. They range from a couple of hundred dollars to tens of thousands of dollars. Nikon and Canon are still the market leaders and offer a wide variety of lenses, so you might as well stick with one of these two brands. I am a Nikon shooter whereas others swear by Canon. Make sure you choose the brand you´re most comfortable with. Take a look at the different camera bodies, the lens options and the accessories. Which brands do your photographer friends shoot with? They might have lenses you can borrow when you’re starting out and they might be able to guide you if you have questions. Once you start investing in a system, stick with it. A system switch will cost you a lot of money which you could spend more wisely elsewhere. If you want to get out to a concert as soon as possible, get yourself a good DSLR and don’t think about it anymore. It doesn’t matter which brand you choose. I use Nikon, others use Canon and there are others who use Sony. Nikon and Canon are the biggest players in the market and offer a wide variety of lenses. Just go to your local photography store, hold some and decide which camera body best fits in your hands. (Alternative: you can also start with a Point and Shoot camera). What you’ll want to get when starting out is a crop sensor DSLR camera. When I started out in photography, I heard the term crop sensor vs. full-frame sensor in connection with digital photography a lot. It took me a while to figure it out. If you’re also feeling lost in the jungle of technical camera terms, let me try to explain. OK, let’s go back to the good old analog times. An analog camera which takes 35mm film (the small film rolls, the ones your parents used to create your holiday photos) delivers negatives with a size of 24x36mm. This size is due to the opening that lets the light pass through the camera and hit the film. The 24x36mm corresponds to the size of the sensor in a full-frame digital camera. In a crop sensor camera the sensor size is smaller, or cropped. Since I am only going to talk in this article about camera gear for beginners on a budget, I’ll only focus on crop sensor cameras. (I don´t forsee that you want to buy camera gear for $5000 right now). Crop sensor cameras are cheaper and you will get a camera body with a lens for a few hundred bucks. Due to the smaller sensor, noise is more dominant in the photos and the available ISO values are smaller. Since the ISO capability of your camera is key in concert photography I would suggest buying a crop sensor DSLR camera with a maximum ISO setting of at least ISO 6400. You will be faced with low lighting conditions on stage and therefore need the option to set high ISO values. The higher the ISO setting on your camera, the warmer the camera sensor will become, which will lead to higher noise levels in your photos. Most of the time, you’ll find yourself dialing your ISO setting up to at least 1600 to get a decent shutter speed in low-light concert photography. There are ways to reduce the noise during post-production, but the aim is to keep the ISO as low as possible. Nikon D5100 (read my review here). Nikon D7100 (read my review here). Crop sensor DSLRs are mostly available as a kit package together with a lens. You can get a decent camera body with a lens such as an 18-55mm f3.5-5.6. This kind of lens is good for “everyday” photography purposes, like travel and birthday parties outside, but it’s absolutely useless for concert photography. So, to go along with your kit lens you will need to get another lens, or save some money and opt for a “body only” purchase. One more thing: A 50mm lens (the focal length will be written on the lens itself) attached to a crop sensor camera body is no longer a 50mm! After a number of workshops I’ve given, I now know that most students of photography have never heard of this before. Therefore I am here to explain it: If you have a 50mm lens on a crop sensor camera body, you have to multiply the focal length with a crop factor e.g. 1.6 for Canon (50×1.6 is 80mm) or 1.5 for Nikon. So the 50mm lens you thought you had, is an 80mm lens on the camera. Confused? To add to the fun, the crop factors for Nikon, Canon, Sony and Pentax are all different, but in general you get a similar focal length. Why is this important? Let´s say you want to buy a wide angle lens for your crops sensor camera. So, you might get a 35mm lens, but on your crop sensor camera it turns into a 50mm normal lens. So, if you want to have a focal length of 35mm on your crop sensor camera you need to buy a 24mm (24×1.6 is 38mm). Just keep this in mind when buying your lenses. Here’s the deal. The kit zoom lenses that come with cameras have smaller apertures (higher aperture numbers). By using an aperture of e.g f5.6, less light passes through the lens (compared to f1.8), which will result in a lower possible shutter speed. From my experience, an aperture of at least f2.8 is a necessity in concert photography and therefore a cheap zoom lens is not an option for use as a concert photographer. You can get zoom lenses with an aperture of f2.8, but they are expensive and not worth the money when you are new to concert photography. Be careful! The 50mm lens will effectively be an 80mm (50mm x 1.6 on Canon, for example) on your crop sensor DSLR. You’ll lose the standard focal length but when first starting out, that’s absolutely fine. If you already have the 50mm f1.8 and you have the feeling that you need a wider lens, then check out a 35mm f1.8 lens (which will be 50mm on your crop sensor body). 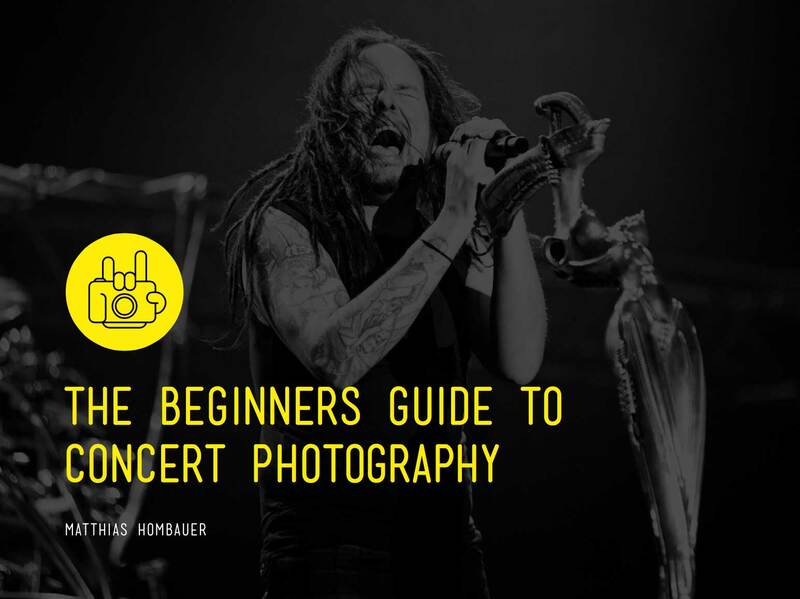 Read on here if you want to know more about my essential concert photography settings for beginners.